The great thing about local design fairs is that it provides both the media and the general public with the opportunity to see and appreciate the wealth of talent we have at home. With this in mind, The Style Index visited the recent Sydney Indesign event and was happy to see so many old and new names keeping up with the OS mob. Although The Style Index has more than a little interest in how our near neighbours influence our own ways of seeing, ie Asia and, in particular, Japan, we are committed to promoting Australian-designed products and services, or those made here. In short, it's a pleasure to show off what's so great about the Australian perspective on design. Earlier today we posted about textile designers Walter G, this afternoon we present Something Beginning With. With close to 10 years' experience in furniture and home ware design, SBW creates elegant Australian-made designs accessible to the residential, commercial and hospitality sectors. The company is a creative collaboration between Melbourne-based designers Lisa Vincitorio and Laelie Berzon. 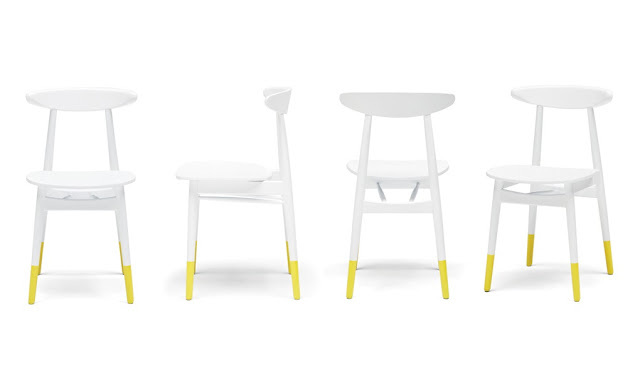 Here below are SBW's Oscar chair in yellow, Ren chair in white and Jac armchair in grey. All fabulous designs crafted here on our shores. For more information, visit somethingbeginningwith.